Ansonia Clock Co. statue clock, "Music", C. 1894. This statue is seen quite frequently with the statue, "Poetry", on the double statue clocks. 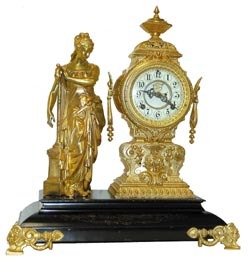 These large statue clocks are very imposing, very heavy, and very beautiful when finished properly. This black enameled iron case, the statue, clock tower, and feet, were all refinished in gold. We have had them refinished ever which way and most folks seem to prefer the gold to the original Japanese Bronze. This finish is bright, shining gold, and can be toned down easily if you prefer a more dull gold. The case stands 21.75" high, and is 19.5" wide. The two piece porcelain dial with the numerals in circles, rarely found on the statue clocks, is in excellent condition, has the outside escape mechanism, and original hands. Movement is 8 day, strikes a standing gong on the half hours, and in running order. Ly-Ansonia #502.